With Spring just a few days away, we have been seeing a lot of unpredictable weather in Toronto - there are days with double digits and then there are days that we are in double digits...below freezing! Dressing for such days also makes it quite frustrating in the mornings as I try to figure out what to wear for those 'in between temperature' days. I always try to be prepared for those dips in temperature because one of my major pet peeves is being cold. For this reason, having layering staples in my closet becomes so important. When looking to dress for this rollercoaster weather, you want layers that will keep you warm but can also be removed as the temperatures begin to rise all while still keeping you looking polished. I'm sharing a few of staples to keep your layering game strong as we transition away from the colder weather. Trench Coat: I wrote a post on the classic trench coat, a piece that I think every girl should have in her closet. Trench coats are timeless and will carry you through most of the year. The trench coat pulls your outfit together while giving you that extra layer of warmth. You can opt for a shorter trench as the days get longer. If you're looking for more tips in choosing the right trench coat for you, read this before you shop. Cardigans: Choose a cozy cardigan in a Spring palette. You'll be giving all the Spring vibes while staying warm. I usually stick to a neutral hues as you can see from the picture above, as it makes it easier when pairing. 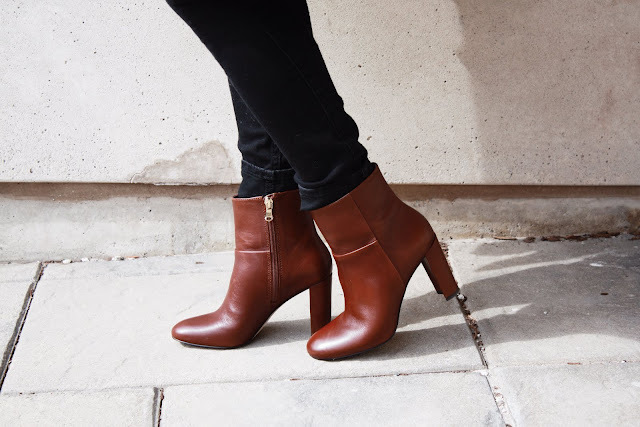 Booties: These booties have become one of my all time favourite booties. They are leather, almond-shaped that elongate legs. Cropped Pants: Cropped Trousers are a lifesaver when you want to show a little ankle or show off those new pumps you've been waiting to wear when the weather is still too cold for skirts or dresses. I linked these blush coloured trousers here. These pants come in both regular and petite sizes! Scarf: At this point in the year, you want to put those wool scarves away and begin wearing lighter ones; in both, colour and material. This Zara blanket scarf is excellent for layering as it is light enough that you won't overheat, but big enough that it can be wrapped around several times, keeping you warmer on those chilly morning commutes. This scarf can also be worn as a wrap in the office or over a sheath dress for crisp Spring evenings.